The Order of the Daughters of the King® is a community of women, a spiritual sisterhood. This means that we pray not only for members of our congregations, but for people in the larger communities in which we live and work, for global issues, and for Daughters around the world. We serve our local churches by supporting them not in only in prayer but in any other way our priests ask us. (We cannot raise money, however.) We evangelize through the wearing of our crosses daily and walking with God in all we do. 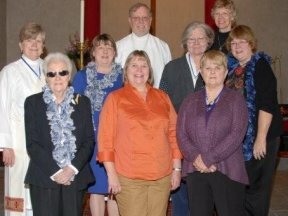 We recently reactivated the St. Martha’s Chapter at St. Stephens and on All Saints day, 2012 inducted five women: Peggy Allen, Joan Bonner, Sandy Bush, Karen Rutherford, and Deby Veach. Several members have been added since then. 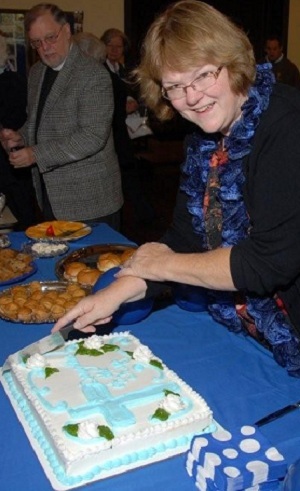 Our service projects include organizing funeral receptions and visitation of the sick and shut-ins. We hold chapter meetings about every three months, with interim meetings scheduled as needed. For more information about the Daughters of the King at St. Stephen’s, please contact our deacon, Deby Veach.